I'm always adding new books based on the cover alone to my TBR list. This week I happened across this book while looking at the new stuff coming out in the next few months. I still haven't read a book by this author but I keep seeing her around. This looks like the one to be my introduction. It sounds steamy and captivating. From USA Today bestselling author Sky Corgan comes a wartime romance that will have you swooning and fanning yourself. I invaded her country, but I’m going to invade more than that. I caught the silhouette of a woman out of the corner of my eye when I was carrying out an execution. She could have been a spy, so I had no choice but to follow her. When I cornered her in an abandoned house, I knew I had to have her. I’m just trying to survive this bloody war. When I heard men’s voices on the other side of the fence, I couldn’t help but be curious. The sound of gunshots sent me scurrying back to my camp. I never expected to be followed. Now this handsome stranger is demanding that I come with him. He says that the only way to save me is to let him put a baby inside me. I’ve never been with a man before, but when he looks at me with those hungry eyes, it’s hard to say no. It doesn’t hurt that he’s a handsome prince. 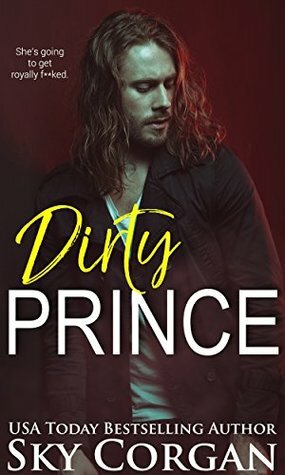 Dirty Prince is a super romantic stand-alone novel. If you thought chivalry was dead, this book will reignite it in your soul.